The automobile as we know it today evolved over several centuries starting in 1769 with the first self-propelled military tractor powered by a steam engine and used to haul artillery. By the 1820's, steam-powered stagecoaches were dominant throughout Britain. Electric engines also predated gasoline engines and were used in vehicles that were very heavy, slow, and expensive. By the early 1900's the gas-powered engine was the engine of choice for people like Henry Ford who invented the assembly line system for automobile manufacturing. 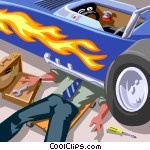 Explore the automotive industry with CoolClips clip art!